Laïka is the unique girl of Henora de la Ghilde des Elfes and Yahvé des Fines Terres. She is a young cat which is almost completed ! She is endowed with magnificent lines of head. A long net triangle, very beautiful eyes of beautiful shape and well placed. Her profile is straight, solid and decorated with a strong chin with an excellent height of jaw. Only her ears could be bigger with an a little wider base. His father Yahvé bequeathed her his magnificent skeleton. Her fur is of very beautiful quality, with a hair of glossy and very present guard, and her tail is XXL ! 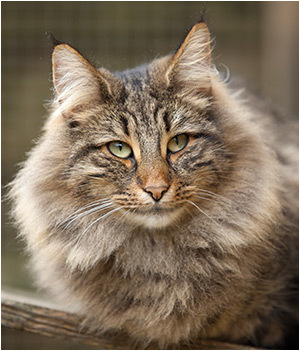 Thanks to you Vaira (Chatterie des Graulières), to have allowed the union of our cats. Yahvé is really magnificent! Lorena is born from the very beautiful marriage between Helka de la Ghilde des Elfes and Yahvé des Fines Terres. Lorena has very beautiful almond eyes and placed well, big ears decorated with attractive tufts, a perfect right profile, extended by a top of head high and rounded as one pleases ! She raises a long tail in panache, and a solid skeleton following the example of her father. Less sticky than her sister Bella Swan (but how to compete ! ), she is very cute and affectionate. Bella Swan is the sister of litter of Lorena. But her assets do not limit themselves to her character of exception. She possesses very beautiful ears with tufts which incrivent perfectly in her attractive triangle of head, which reminds strongly that of her mother Helka. The made up eyes the expression of which reveals sweetness and intelligence seduce me. She has a very solid profile, and her fur already shows an excellent quality ! Henora arose from the marriage between Axane de la Ghilde des Elfes and Alonso de Khazad-Dûm. Henora is a young female which fills me! She allies very sensibly the assets of her two parents. Long fine triangle, matched by big ears with tufts, of beautiful forms and placed well. Perfectly straight profile following the example of her mother, but with a better forehead than this latter. Beautiful wild look, served by an attractive contrasted spotted. She's high and long of body, with a good tail in report, and her fur quality is exemplary ! Helka, own sister of Henora, girl of Axane and Alonso, also stayed at home ! She has got different assets from the latter, but also attractive for me. Expression, eyes, fur, length of tail and morphology are a part of it, without speaking about her ears, which could certainly be a little bigger, but which join perfectly an attractive net triangle. Her profile is not perfectly straight but on the other hand, she shows a convex forehead and a good height of head. Her mackerel is contrasted and its ideally symmetric white dots ! 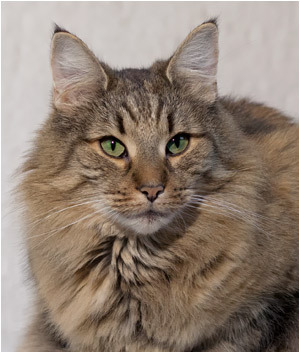 Very beautiful cat, endowed with an excellent profile, decorated with a strong chin, with a triangle in the pure lines, enough long and, essential quality for me, sublime green eyes in size, trains forms and placement ! Vanir possesses an exceptional skeleton, very strong legs, in particular for a female. Her fur is not very long but dense and of good texture. 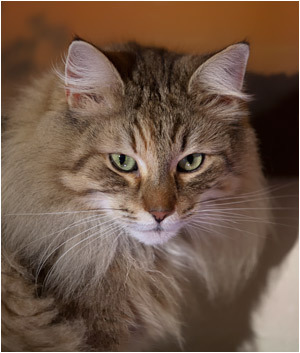 Ankara is a beautiful and strong well-balanced cat which possesses qualities looked for to our current Norwegian cats. In particular, a robust skeleton as well as a magnificent straight profile extended by an attractive on-line going back up convex forehead continues between ears, inherited from her mother Vanir. She holds of his father the typical wild expression of the race, a harmonious morphology and a fur in the woolly and consequent sub-hair. Both, she inherited an exemplary character, ultra cuddle and sure of her. The demonstration of more "talking" of her tenderness consists in banging and in rubbing the head against us as well as in sheets, in ample movement forwards in the style of a wild boar ! Her presence is remarkable and noticed in the daily life ! Axane is the own sister of Ankara. Of a slightly lower but more already completely respectable size, she shows an attractive Norwegian look and a real imposing presence. She possesses big well placed ears. Her profile is perfectly straight. In the ideal, I would have liked a forehead more convex, following the example of her litter's sister. On the other hand, her excellent lower jaw brings her structure and solidity of the lines of head. Her fur is enriched by warm colors magnificently distributed. Axane sleeps almost always with me. She's an adorable and very "classy cat" which cannot deny his father of a behavioral point of view. To quote only it, she overflows regularly uncontrollable pushed of affection, which show themselves by roulades, fervent nibbles and smothered miaowing ! Izzara is almost perfect, I would dare to say ! She's got a long net triangle, big and wide ears perfectly placed and decorated with attractive tufts, with oblique eyes and in almond to melt an iceberg, and a very precise, solid and convex profile as one pleases ! Only her chin could be a little bit stronger. Her long and high body, supported by very strong legs, following the example of her mother Coors, ends by a very long tail. In her birth, she was a member of rare kittens which extract you an admiring "wouah"! And her evolution is only confirming the initial impression. 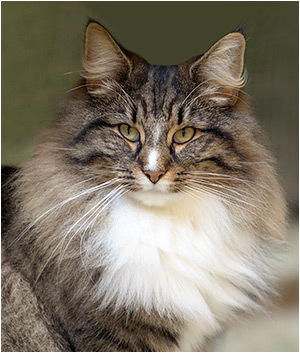 Radjah is a very well-balanced cat, endowed with a beautiful wild expression, with a straight profile, with well placed ears and with a double fur with the very dense sub-hair. 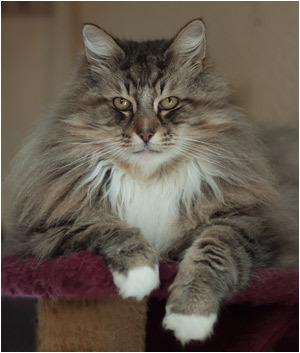 He seduced me first of all by his beauty, made me discover the exceptional privilege to live with a cat with a ideal temperament and in the end, definitively brought me loving of the Norwegian cat !